Fuel Moto offers 100% product support on the Dynojet Power Commander V. We have the worlds largest Power Commander map database offering calibrations for most popular combinations. For those of you with unique setups or are looking for live tuning the PC V offers the optional Auto Tune module with wideband O2 sensor (dual sensors on V Twin models) which will allow you to tune in real time. We have extensively tested this product in many, many applications. Fuel Moto will pre-program your Power Commander for your specific setup based on the modifications you have done to your bike, we also provide legendary Fuel Moto service before and after the sale. Get your Power Commander V now! Harley models also display J1850 data from bikes ECM such as temp, fuel pulse width, timing advance, spark knock, etc. Auto Tune kit includes Bosch Wide Band O2 sensor(s) and control box(s). Plugs directly into the PCV and allows for automatic fuel adjustments. Each map cell is individually adjustable so you can specify an exact AFR value for each area if needed. The first major improvement over PC III from a tuning standpoint as far as Harley models are concerned is the ability to capture live ECM data thru the PC V software. In addition to the available functions in PC III USB software such as RPM, TPS, Duty cycle, and fuel change, the PC V now allows you to view valuable ECM data such as Cylinder Head temp, Intake Air temp, MAP, Battery Voltage, F/R Cyl Injector Pulsewidth, F/R Cyl Ignition Timing, Knock Sensors, Vehicle Speed, Gear Position and more. In addition, when the Auto Tune module is used real time AFR is also displayed, this is awesome! You can also view or log these parameters with the optional LCD-200 display as well. 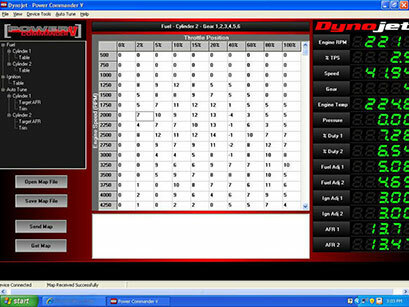 The software features individual tables for each cylinder for fuel and ignition timing as well as demanded AFR tables for each cylinder if the Auto Tune module is used. Fuel tables continue as a percentage of fuel change and ignition timing is in degrees. Another big improvement is the ability to control EFI adjustments based on additional inputs such as gear position. For example you may want to lean the mixture a bit for 6th gear highway cruising for better MPG? No problem, the options are nearly endless and can be easily configured in the PC V software. You can also easily configure the PC-V to run 2 maps using any open/closed style switch. PC V continues to allow users to raise the Rev limiter to 6200 RPM's and the Accellerator pump feature is included in the software. Gone is the 9V battery adapter that was required on the PC III USB for powering the unit when removed from the bike to make changes, the PC V now is powered thru the USB connection when removed from the bike. Another great feature of the PC V is its size, as the PC V is much smaller than the PC III USB. This is especially helpful on bikes with tight fitments such as the Softail where we can now easily mount it under the seat, or on the Dyna where we can mount it in the hole in the frame under the seat. 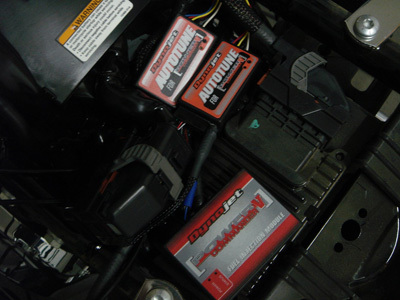 Auto Tune is the ultimate add on for PC-V which allows for live, closed loop EFI tuning. Based closely on Dynojet's new Wideband Commander 2 featuring an Auto Tune module and dual Bosch Wideband O2 sensors. The Auto tune module allows users set a demanded air/fuel ratio in the PC V software and the Auto tune will make adjustments in real time. There are AFR tables for each cylinder and they have the the same 250 RPM increment resolution as the fuel and ignition tables. The Auto tune can be configured for minimum run time before live sample, minimum Cylinder Head temp, as well as maximum +/- fuel adjustments in relation to the base map. The Auto Tune kit can also use the Dynojet map switch or any open/closed switch which allows the user to switch between live tuning to the parameters set thru the PC V software or the base map in the PC V unit. You can leave the map switch in "live" mode, or if you want to write the fuel map you can connect to the PC V software, retrieve the fuel trims and either write them to the map or clear them. The firmware and tuning strategy has been well written and in our testing we have been able to develop very, very accurate maps using the Auto Tune module opposed to some of the other Auto tune units on the market we have tested in the past. We have also compared several Auto Tune derived maps to dyno tuned maps and the results were impressive. A very important requirement for building a good tune is to have a somewhat close base map to start out with, as the Auto Tune writes its fuel trims off the base PC V map. The Auto Tune module does require some basic wiring from the sensor harness into the modules. The Auto Tune module is a very good choice for those with a unique build where a close map is not available or for those looking for the ability to tune in real time. The ultimate combination we recommend is combining a full dyno tune session with the Auto tune. We build the map for the best combination of performance and efficiency, and then implement the AFR's we developed into the Auto Tune AFR table. This strategy will provide the best performance under all conditions. Auto Tune modules are in stock and we also have several excellent AFR tables we can supply to fit your riding style or requirements. If you purchase the PC-V and Auto Tune module we can program and configure everything so it is ready to plug in and ride. 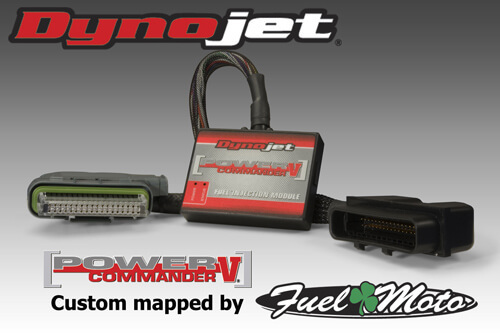 Why purchase a Dynojet Power Commander from Fuel Moto? 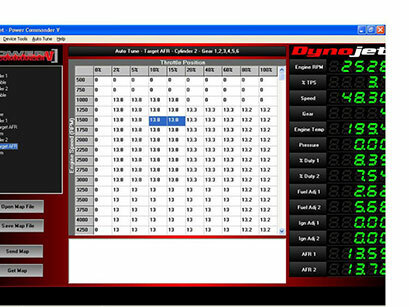 Dynojet tuning products are our main business. We offer the best service in the industry, we tune motorcycles all day, every day. We are highly committed to Dynojet products and are the #1 dealer of Dynojet products on the planet. We sell, install and tune more Power Commanders than anyone, anywhere. When you contact Fuel Moto you will be working directly with the EFI Tuning Professionals. Our certified Dynojet tech's will take the time to answer any technical, installation or pricing questions you may have on any Dynojet product we carry anytime, before or after the sale. Give us a call at 920-423-3309. Fuel Moto even purchases various new motorcycles to use exclusively for the testing and development of our Power Commander maps. This in-house development allows us to offer our customers unmatched product support with our database of Power Commander maps and technical information. When you purchase a Power Commander from Fuel Moto you purchase more than just a Power Commander. Our professional staff is here to make your bike run at its best. You will be receiving a custom tuned fuel injection module that comes to you pre-programmed for your personal bike based on the information you provide. We are not simply loading a map, we are programming the Power Commander with maps and information that has been developed for the intake and exhaust changes you have made to your bike using our experience and expertise from 15+ years of dyno tuning. We live, breath and race motorcycles and have a true passion for tuning. At Fuel Moto we pride ourselves as being at the very top of the motorcycle EFI tuning trade and we even have developed several proprietary components and applications for our Dynojet 250i dyno which allow us to have the most consistent, most accurate and best performing EFI maps available. We have the largest map database in the country and we continually develop new maps in-house. 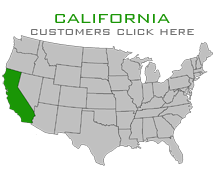 Our expertise and maps have become well known across the country. We live, breath and race motorcycles and have a true passion for tuning. With our Power Commanders we offer a complete tuning package, from the Power Commander unit, to the programming, to the certified Dynojet tech support. There are several features you can add to your Power Commander for no additional cost. We can download and set up the Accelerator pump feature which increases throttle response and off idle abruptness. We can also take into consideration your riding style or special concerns such as fuel mileage. Additionally, on Harley models we can raise the factory rev limiter to 6200 RPM's the Power Commander's Rev Xtend feature. What this means is when you receive your Power Commander it will come to you "plug and play" so you are ready to install and ride. Feel free to contact us for details how the Power Commander will improve your specific bike. Fuel Moto doubles the warranty on the Power Commander making the warranty period 2 years. Furthermore, if you purchase a Power Commander from Fuel Moto we offer Map support and will supply you with any different maps you may need as you make future mods to your bike. We also provide in-house certified Dynojet technical support on the Power Commander so if you have any questions or problems along the way on programming or tuning we are just a call away. Dynojet periodically makes changes and upgrades to the Power Commander, our Power Commanders are guaranteed to be the absolute latest version with the latest firmware and upgrades enabled. If you have technical questions before or after the sale you can contact us at 920-423-3309 or email us at and we will be there to help. Simply put, you will not find better customer service and product support anywhere!